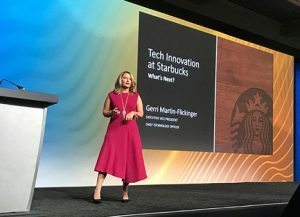 Innovation at Starbucks isn’t just about technology; it’s also about language, the coffee company’s EVP and CTO Ms. Gerri Martin-Flickinger said at the recent Gartner Symposium in Orlando, Fla. For example, there is no IT function at Starbucks; it’s called Starbucks Technology. “[Once we rebranded IT,] we started thinking about ourselves a little differently,” Martin-Flickinger said. She said by taking off the artificial restrictions they had in their thinking about what IT was and what it could become, they became something bigger. “But it wasn’t just how we felt about it; it was also how our business partners felt about it. They started thinking about us differently.” Another word change: There are also no “employees” at the coffee giant, only “partners.” It’s all part of Starbucks’ internal rebranding that started a couple of years ago and includes a revamped workplace culture, technology investments and mission statement all centered on providing digital engagement on a global scale. “The best technology is the technology that actually enhances human connection,” Martin-Flickinger said. “I can’t think of a better brand than Starbucks that believes in the human connection.” The star of the company’s digital lean-in position is its popular Mobile Order and Pay app, introduced in 2015. Since its rollout, the percentage of mobile-order transactions has continued to grow each quarter. At peak times, at least 2,000 stores are seeing more than 20% of transactions coming through this channel. But Starbucks’ digital transformation goes beyond just an app, according to Martin-Flickinger. She offered a glimpse into the present state and future of innovation at Starbucks, which includes a cloud-based platform, collaboration tools, virtual reality (VR) and conversational computing. With so many stores in so many countries, communication and collaboration between personnel can be difficult. To connect its employees, the company has turned to a workplace collaboration platform: Facebook at Work. “When we opened up Workplace, almost immediately we had store managers and partners telling us about the tech in their stores and ideas they had about how we could make it better or what we could do differently,” Martin-Flickinger said. “What’s really exciting is that our technologists — even our front-line technologists — have the opportunity to engage in that conversation directly.” More than 80% of the chain’s store managers are using Workplace on a weekly basis, forming their own macro- and micro-communities, she said. Everyone in the executive team is engaged constantly on the collaboration platform, she added. Even Starbucks CEO Kevin Johnson uses it every week for a chat and a video conversation with partners. Innovation at Starbucks also comes in the form of 3D renderings and virtual reality. Before completing final construction of a new store, the Starbucks team can tour it through detailed 3D renderings made in partnership with software company Autodesk. These renderings, which are viewed by vice presidents and store development teams through VR headsets, give a realistic view of each new store — in the context of its surrounding environment. The Starbucks teams, for example, can view the layout at different times of day and see how the sunlight will move through the store as the day progresses. Even more impressive, Martin-Flickinger said, is teams can interact with the environment while wearing their VR headsets, moving furniture or even making a simulated beverage behind the counter. Another emerging area Starbucks is exploring is conversational commerce. Martin-Flickinger showed an example of a customer speaking her order into her phone and a chatbot engaging with her via written text to inquire about the details of the order and place the order for her.